The 24-Hour Mommy: Join Ceelin's Cool Chew Craze online video contest! 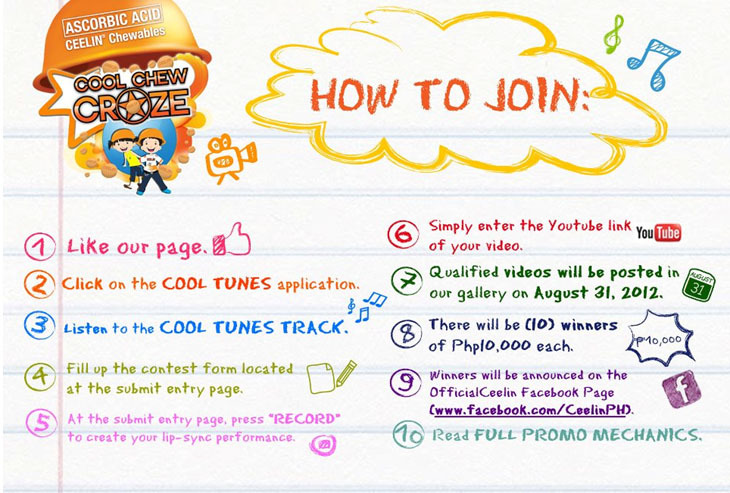 Join Ceelin's Cool Chew Craze online video contest! Your child will be lip-syncing to the Ceelin Cool Chew Song. Make sure you help him jazz up his performance with cool and creative moves because not only will he have a better chance of winning Php 10,000, he might also be part of the official Ceelin video along with a secret guest celebrity! Click here to view the video mechanics. To help your kid perfect his performance, also have him rehearse with the Ceelin Cool Chew Craze Practice Video by clicking this. Qualified videos will be posted in the Ceelin Cool Chews gallery on August 31, 2012. Ceelin Chewables is an orange-flavored, Vitamin-C tablet for kids. A dose of Ceelin Chewable tablet every day enhances the kids’ immune system, increases their appetite and keeps sickness at bay, allowing them to enjoy more fun activities at home and in school. 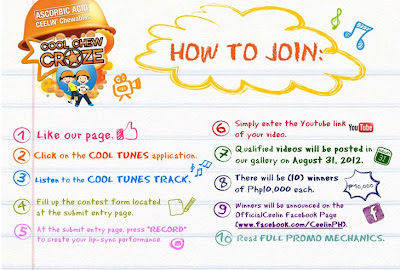 For more information and updates on the Ceelin Cool Chew Craze, you may visit the Ceelin Chewable fan page on Facebook: https://www.facebook.com/CeelinPH. sayang baby pa si Tiki. di bale, ipe-prep ko si kuya Clyde. chocohyper lang yan and I'm pretty sure, kuha na namin ang prize.